I admit it – I’m pretty much addicted to pumpkin. I have a list on my iPhone of 23 pumpkin recipes that I must create. And I’ve already started my pumpkin can tower which has officially toppled over in my pantry twice. Not awesome when you have a small pantry with drawers because I pretty much have to sprawl face first on the kitchen floor to retrieve anything that falls. Admit it, you’re totally picturing this is your head right now, aren’t you? With my leaning tower of pumpkin and my embarrassingly large container of Homemade Pumpkin Pie Spice, I’d say I’m fully prepared for the next 3 months of pumpkin goodness. When my stash of Homemade Pumpkin Pie Granola was gone, I couldn’t resist taking this sweet and spicy flavor combination to a different level with Homemade Pumpkin Granola Bars. They’re loaded with oats, pecans, dried cranberries and pumpkin seeds. And if you ask me, they’re pretty much Fall breakfast perfection. 1. Preheat oven to 350° F. Line a 9x9 baking pan with foil allowing for 1 inch overhang on the sides of the pan. Spray foil with non-stick cooking spray and set aside. 2. In a large bowl, combine oats, pumpkin pie spice, and salt. Set aside. 3. In a medium bowl, whisk together brown sugar, pumpkin puree, applesauce, honey, and vanilla until smooth. Pour over oats and stir until oats are moistened. Stir in cranberries, white chocolate chips, pecans and pumpkin seeds. 4. Evenly press oat mixture into prepared pan. Bake for 35-40 minutes or until golden brown. Be sure not to underbake. Remove to a cooling rack to cool completely. 5. Use a sharp knife or circular cookie cutter (see note below) to cut into bars. 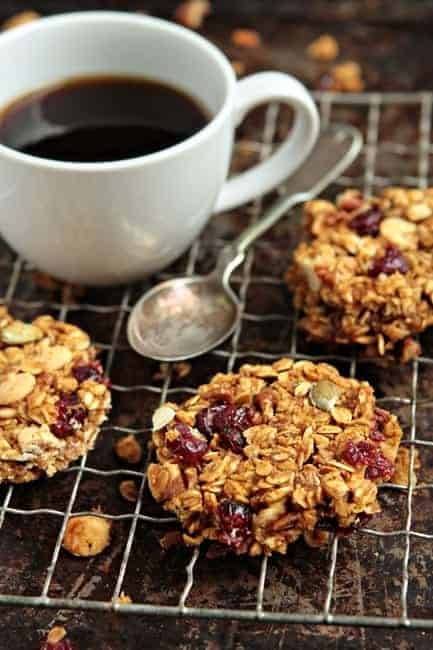 - I used a round biscuit cutter to cut my granola bars into fun, circular shapes. - The pumpkin puree adds moisture to the recipe, so you definitely want to make sure you bake the bars long enough so they'll hold their shape. - This recipe is easily adapted to suite your taste - get creative with different nuts, chocolates, and dried fruits. Mmm these look lovely! And I like how you cut them into little circles. Cute! This looks wonderful. I might cut down on the sugar when I try it. Absolutely gorgeous fall photo — and the recipe looks yummy too! I’ve done a granola like cookie like this before and I love them!! So wonderful and love the pumpkin/applesauce in here…swoon. Jamie, I love these granola bars! They are gorgeous. I’ve been meaning to make pumpkin granola bars this season and can’t wait to give these a try! Thank you for posting them. I love the unique circle shapes. I agree this is pretty much fall breakfast perfection! I am going to make these for my husband’s hunting trip. They will provide lots of energy. Thank you! These are the perfect fall breakfast! These look wonderful! What a great autumn snack. I love that you added pumpkin seeds and cranberries, too. I want to know what’s on that list of 23 pumpkin recipes! Mmm these look yummy. Just curious, how long do you think they’ll keep? They should keep for a few days in a sealed container. I hope this helps – have a great day. It is so good to see pumpkin sneaking back into everyone’s recipes! I love this time of year! I don’t think I’ve ever been so excited for a granola bar recipe as I am with this one. :D SO excited to make them! LOVE your recipes. I’m so excited to be baking this fall. The pumpkin granola bars look great! I’ve never tried pumpkin in granola bars but these sound just perfect for an autumn breakfast snack! Just last night I was thinking of my pumpkin addiction and wondering when Jamie would start her pumpkin recipes. And as I sit here eating a store bought granola bar, this recipe couldn’t have come at a better time!! Yay! It’s definitely pumpkin time – I have so MANY things to make! Thanks for stopping by! I’ve never tried pumpkin granola bar! This one’s made me wanna try it! They look really tasty. I’d love them on my lunchbox! I love that you cut these into little circles instead of bars!! :D Very cute, and very autumn-y. Big fan! I made this recipe tonight and they turned out great! It’s the first time I have ever made granola bars. Thanks for the great recipe! I’m so glad to hear that you enjoyed the recipe! Thanks for coming back and leaving your feedback. Have a great day. I’m pretty obsessed with pumpkin, too! What a great breakfast! Tried these the other day and they turned out great! I used cranberries, sunflower seeds and wheat germ (3/4cup) instead of choc,nuts, and seeds (allergys). baked in muffin tin with liners for 25 min, made 16 (just fill with mix and press down, top it off with more mix if you need to and press again). hold its shape well so its perfect on the run! Thanks for the recipe the kids love them! Oh, I love the idea of using the muffin tin instead! Thanks for stopping by Marie. These look so good, I will try these when I get some cranberries. ANy idea on the calorie content? I’m shopping for the ingedients I need to make the Pumpkin Granola Bars. Would like to know the nutritional info for a single serving if possible! I do not have nutritional information. You can plug the recipe into a nutrition calculator found on google to get what you need. I absolutely love these and have made them twice now…but I can’t get them to sick together in bars. They end up more like granola. Suggestions? Have you had any problems with this? You might try adding a little more honey. Thanks for stopping by. Is there anything I can substitute for the honey? Would I be able to use regular sugar or brown sugar? You might try maple syrup instead of honey. I hope this helps. We love these! We switched out the pumpkin seeds for sunflower seeds and my 8 year old son can’t get enough of them. They are also a welcome cub scout and classroom snack. I just found your recipe via Pinterest, so it will probably be a while before I get around to trying it. When I read about your pumpkin can tower, my first thought was “Oh, canned pumpkin?? ?” I’m not trying to be a pumpkin snob, but no canned stuff for me! Have you even tried fresh? There is NO comparison, if it is done right. A couple of years ago, I made a batch of cookies with a small can of pumpkin that was given to me by my sister (she was moving, and didn’t want to take it with her). Something was off. Two weeks later, I made another batch with my frozen pumpkin, and since there hadn’t been a lot of time that passed between batches, the taste was still fresh in my mind. That basically sealed the deal. My memory of the canned stuff was kinda foggy, because it had been such a long time, but the cookie test was all I needed. I try to grow pie pumpkins every year, and although I don’t can, I do freeze what is cooked. DO NOT USE Jack O’ lanterns. I know some people do, but I’ve cooked many a pumpkin over the years (lots of experimentation), and only use certain varieties. I stick with Winter Luxury, Early Small Sugar Pie, New England Pie, and a few odds and ends that I want to try, but definitely nothing that is grown for carving. I’ve even cooked Jack-Be-Littles, and they are just fine. I’ve tweaked my cooking methods over the years, and now stick with what works the best for me. I’d be happy to provide my instructions, but am not sure how to go about it. Thanks! These are absolutely Dee-lish I’m making my second batch!! Thank you, Kim! I’m so glad you enjoy them! I made these with some alterations to accommodate what I had in my pantry. I added some sugar free maple syrup because I didn’t have enough honey, some flax seeds, pumpkin seeds and Heath bits instead of white chocolate chips. I used my mini muffin pan…baked for 25 min. Then I used up the rest of the mixture by rolling it into 1″ balls and baking 20 min. They are delicious! Some were a little crumbly, but we didn’t care. I think that was because of the extra seeds in included. PS Thanks for the recipe for Pumpkin Pie Spice! I love your alterations, Susan! I’m really glad you enjoyed them!